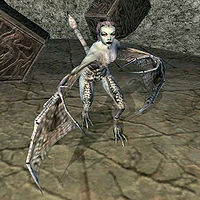 Molag Grunda is a winged twilight in Dubdilla's lower uncharted caverns, directly south of Vos. Her lover, Nomeg Gwai, is a lowly frost atronach. Molag Grunda's father, Molag Bal, doesn't think too much of her and wants them both killed so he can punish his daughter for eternity. A Cure for Vampirism: Find the elusive cure to the dreaded disease. She has a few more HP, a higher soul value, and hits harder than a regular winged twilight. The Dissident Priests claim the story of Vivec having children with Molag Bal is impossible as Daedra "can't create life" (a claim also noted in Aedra and Daedra). Molag Grunda's existence contradicts this, and lends weight to the rumors mentioned in Notes on Racial Phylogeny that men and mer may breed with daedra. Alternatively, she may just be adopted as winged twilights are typically found in Azura's domain. Molag Grunda also appears in ESO. This page was last modified on 26 February 2017, at 03:56.